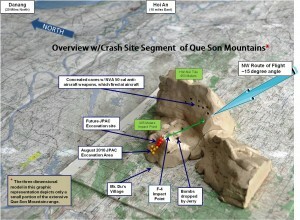 Ron created a three-dimensional clay model of Jerry's crash site so that Elaine could better visualize the overall event and location (click to enlarge photo). Ron’s and my recent visit to JPAC HQ in Hawaii gave me an opportunity to learn more about the organization that has become a major part of my life in the past few years, as well as to regroup on Jerry’s case. Well in advance of our visit, Ron made an appointment with Johnie Webb, Deputy to the Commander for Public Relations and Legal Affairs, and we lucked out with our timing and caught him at Hickam AFB where JPAC is located. We had an excellent visit that included a tour of the facility and a casual discussion about JPACs mission of recovering and identifying the remains of MIAs like Jerry and Al. As most of my blog followers know, our family has strongly supported JPAC, now under the Command of Maj Gen Stephen Tom, USAR, reporting to the Pacific Command (PACOM). We are grateful to have our active duty military leading the effort to recover our loved ones, since Jerry, Al and thousands of others gave their lives in support of our country. Although we didn’t focus solely on Jerry’s case, I was able to fill in some of the post excavation blanks. Here is an update. • Jerry’s and Al’s excavation in August 2010 went as expected, meaning that no remains were found, but the team left with a lot of evidence that proved they were in the right place—a very important point, considering the debris field of an F4 crash! • Excavations of jet crashes often necessitate that teams leave these sites open if warranted by compelling evidence. This means that they intend to return at a later date and continue their work, which is why JPAC did not close Jerry’s and Al’s site in 2010. • When a site is left open, JPAC must make a determination as to the criticality of returning sooner or later. Normally, this determination is based on a number of criteria, not the least of which is concern about geographic location. Today, most of JPACs excavations in Vietnam are the toughest, involving downed aircraft in the Central Highlands, which is where the Que Sons are located. Home to a lot of Marines and soldiers during the war, I am certain most remember this dangerous area. Although it’s no longer a battlefield, the Que Sons are plagued with hellish monsoon rains, rugged landscape with crusted clay soil, impregnated with sharp rocks and triple canopy that used to hide enemy-controlled caves with 50 cal machine guns! But most destructive is the viral-like acidic soil that feeds on our loved ones remains and everything else–time is running out in Vietnam. • Because Jerry’s and Al’s site looks promising for success, JPAC likely wants to limit deterioration from harsh weather, so I am hoping they will return in 2011; however, I have no way of knowing if that will happen, since JPAC does not announce the specifics of its excavations ahead of time–schedules are fluid, and change is not uncommon. But we probably have a better shot at a 2012 return. • My thoughts about the chances of success in finding Jerry’s and Al’s remains? Guardedly optimistic! This entry was posted on Thursday, January 20th, 2011 at 8:28 pm	and is filed under Captain Jerry Zimmer Recovery Efforts, Vietnam Crash Site, Working With JPAC. You can follow any responses to this entry through the RSS 2.0 feed. You can leave a response, or trackback from your own site.